Cyclamen (Cyclamen spp. ): growing, planting, caring. Amazing flowers in the autumn, usually kept as houseplants. Scientific name : Cyclamen spp. Cyclamen is a genus of 23 species of perennial flowering plants in the family Primulaceae, native to Europe and the Mediterranean Basin east to Iran. They grow from tubers and are valued for their flowers with upswept petals and variably patterned leaves. Leaves come up in autumn, grow through the winter, and then die in spring, then the plant goes dormant through the summer. Most species are not hardy. Cyclamens are low tuberous perennials, with round or heart-shaped leaves, sometimes stained with whites, evergreen until spring. The flowers are less than 3 cm, with 5 petals, mostly pink or white. Beware, according to the varieties! For rustic cyclamens, such as C. hederifolium, C purpurascens, and C. coum, plant outdoors, sheltered from direct sunlight, in moist, well-drained soil. The others are planted in cold greenhouses or indoors, in pots, in a mix of loam, compost and moorland. Water during the summer period but without excess, once a week if it is very dry, rather in the morning and sparing the leaves. In pots, wait for the soil to dry between two waterings, which you will repeat up to 3 times a week. Do not water during dormancy, in summer. 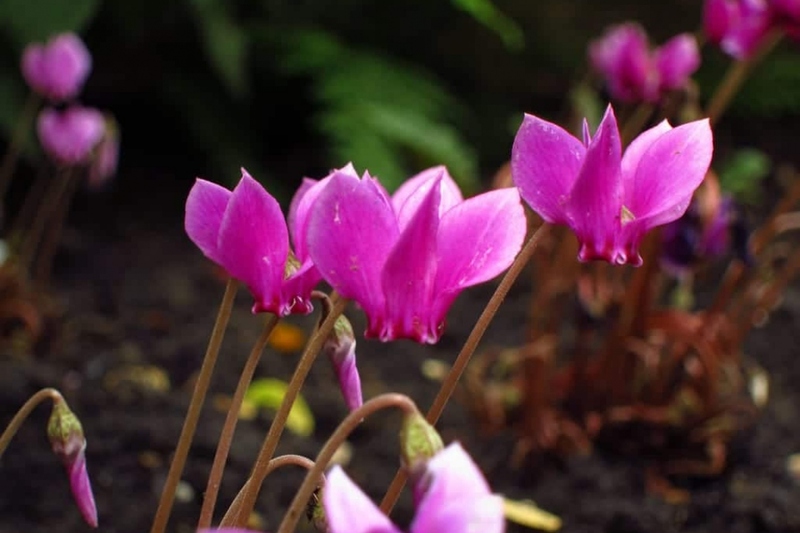 Collect seeds after the flowering of your cyclamen, and sow them in early spring, in the dark, for a fall set-up. Soak the seeds overnight in the water before sowing. Mulch the cyclamen outside to protect them from the cold weather, with a layer of straw or dry grass. Vigilant deadheading will prolong the blooming period ! Remove or cut the entire stem : this is necessary because if there is a faded stalk left, it may rot, and so will the bulb. Bring the frosty varieties of cyclamen potted before winter inside, in a bright place but without direct sun - the ideal temperature being around 16 to 18 ° - with some freshness at night. Take out your frosty cyclamens after the last frosts, and place them away from direct sunlight. Potted cyclamens fear watering on their leaves or their flowers, that stain them, and excess watering that makes them rot. Dry leaves indicate too much sun exposure, while yellow leaves indicate soil impoverishment.